Please launch software Scilab on your computer. To install Scilab, please consult http://www.scilab.org. On this Internet page, you will find Scilab instructions lines starting with -->. You will copy them (or paste them by copy-paste) in the Scilab window to see how they are executed. Beware not to copy the prompt -->. Every line starting with // is a line of comments and is not executed by Scilab. To begin, just type “x=8” in the Scilab window. Build a matrix with 4 rows and 9 columns with 1 on the first row and 0 everywhere else. Use the above examples to build it by blocks. Build a matrix with 3 rows and 5 columns: the first column is made of 2, the second of integers ranging from 1 to 3, and the rest is made of -1. Build a matrix A=rand(5,3). This matrix has three columns: multiply the first column by 5, the second by 2 and the last by 7; use only the following Scilab operations *, . * and ones. For planar graphs, you have Scilab macros plot (elementary) and plot2d (with many options). Execute the instruction help plot2d to have information about the many options of plot2d. 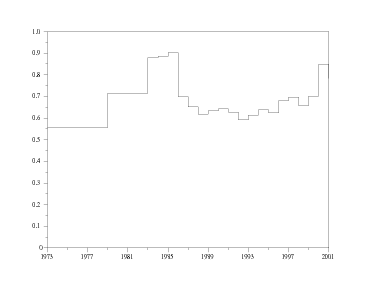 Question 3 Plot the years in abcissa and the price of gasoline (euros of 2001) in ordinates. Take care that the ordinates graph ranges from 0 to 1 euro. Scilab is an interpreted language, where the transmission of the arguments is made by value, even for the objects of matrix type. It is thus recommended to avoid the loops, as they can prove ineffective in term of computation time. For that purpose, it is better, if possible, to make use of the vectorial operators who perform the same operations. We recommend to use a text editor (Emacs), to open a file (for instance file_name.sce), to write the code lines and to execute them inside Scilab with the instruction exec("file_name.sce"). One may define a Scilab function interactively. However, it is more practical and flexible to write the Scilab code in a file with a text editor. One can mix Scilabinstructions Scilab and functions definitions in a same file, named with the extension .sce. and the code ends with the keyword endfunction. Question 4 Write the function sinus cardinal ( ). A Scilab function in Scilab may have several arguments, scalars or vectors. A Scilab function in Scilab may have several outputs. Knowing function and , we are able to compute the whole sequence solution of the problem. Question 5 Change the population dynamics with where . Compare the behavior of the solutions . with the emissions growth set to and initial emissions to (GtC). Question 6 Change the mitigation rate ( ) to compare the behavior of the concentrations profile . where is the intrinsic growth of prey while is the intrinsic decrease of predator. Parameters are related to the catchability and efficiency of trophic relations. Question 7 Change parameters or to compare the behavior of the populations .